March 3, 2016, — Lt. 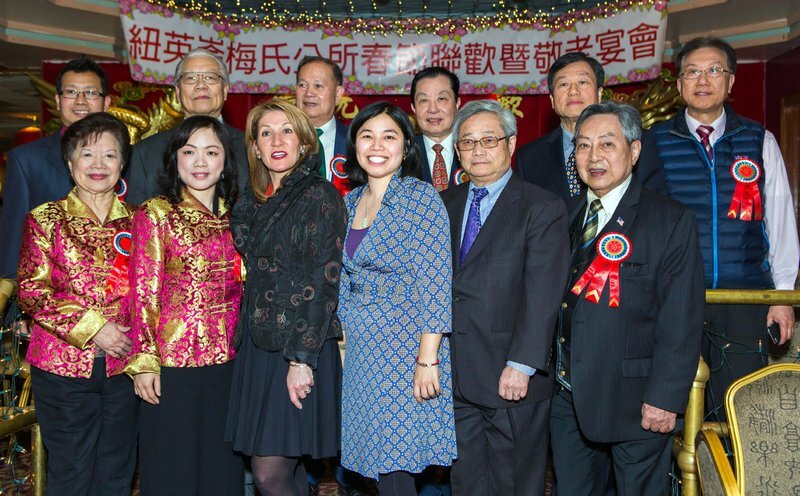 Governor Polito recently attended New England Moy Family Association’s Banquet in China Pearl restaurant to celebrate Chinese New Year. She offered best wishes to about 400 guests in the lunar new year of Monkey. (first row from left) Ruth Moy, Lili Mei, Lt. Governor Polito, Sherry Dong, Paul Chen and others pose for a picture (photos by Fenfang Mei). When Chinese people began settling in American cities in the late 19th century they set up organizations to help future Chinese immigrants find work, a home, and make connections to family and friends. Some of these organizations offered membership based on family name. Called family associations these organizations became an important social and civic glue for the existing community and a tool for integrating newcomers into Chinatowns all across America. Members of the Moy Family Association have last names of Moy or Mei, which is 梅 in Chinese, and means the plum flower. Michelle Wu, President of Boston City Council, Director General Scott Lai and Dupty Director General Bruce Chen of Taipei Economic & Cultural Office in Boston, Edward Guo, Director of Taipei Economic & Cultural Center, and Paul Chen, president of N. E. Chinese Consolidated Benevolent Association attended the banquet. Ricky Moy, owner of China Pearl restaurant, prepared a delightful menu for this occasion. Lili Mei and Shaobing Mei, presidents of N. E. Moy Family Association thanked Lt. Governor Polito and other distinguished guests. 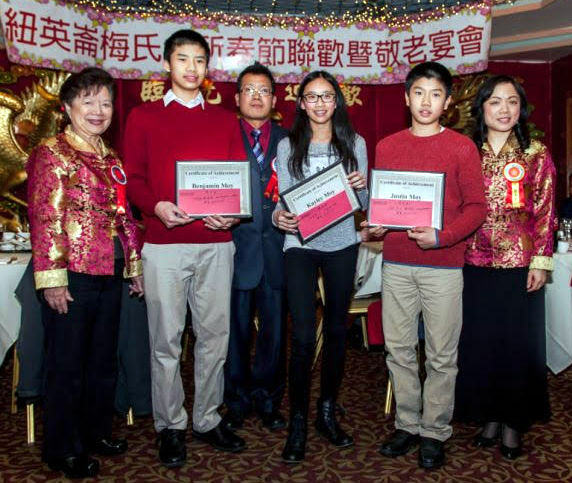 Lili Mei and Ruth Moy handed out scholarships on behalf of the association to middle school students Kayley Moy, Justin Moy, and Benjamin Moy. Please find more pictures from the banquet below.